We’ve had a bit of cool weather the past few days which made the recipe for Flannel Bread sound appealing. It reminded me of flannel pjs and flannelette sheets. The recipe from the 1898 New Galt Cook Book was contributed by Mrs. T. Hepburn of Preston. I put 2 eggs in a bowl and added about 1 tablespoon butter. Next was 1 pint (2 cups) of milk and then the dry ingredients a bit of salt, 2 teaspoons of cream of tartar, 1 teaspoon baking soda and 2 cups of flour. The amount of flour seemed about right but it was odd to have lumps of butter in the batter. I wasn’t sure if it would work in the end but at least the batter comes off the spoon easily. I added some grease to a frying pan and then dropped some of the batter into it. Basically this recipe makes pancakes. Once they were cooked on one side I flipped them and finished them off. Once onto a plate with a bit of butter on top they were ready to eat for supper. 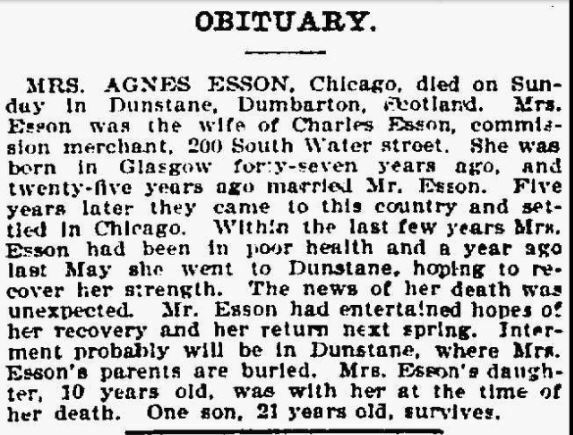 Mrs. T. Hepburn of Preston is Emily Hinderer. She married Thomas Hepburn and they had a daughter Leila May. These are basic pancakes. There’s nothing wrong with them but there’s nothing special either. The lumps of butter dissolved without a trace so I didn’t need to worry after all. I’m not certain about why this is flannel bread rather than pancakes. Two eggs, butter about the size of an egg, one pint milk, a little salt, two teaspoonfuls cream tartar, one teaspoonful soda, flour enough so that it will drop off spoon. Today is Shrove Tuesday, an important day for some Christians but also known as Pancake Day by many others. It is also Mardi Gras (Fat Tuesday) the last day before the Lenten fast. I didn’t grow up with the Pancake Day tradition but have embraced it as an adult — any excuse to have pancakes for supper! 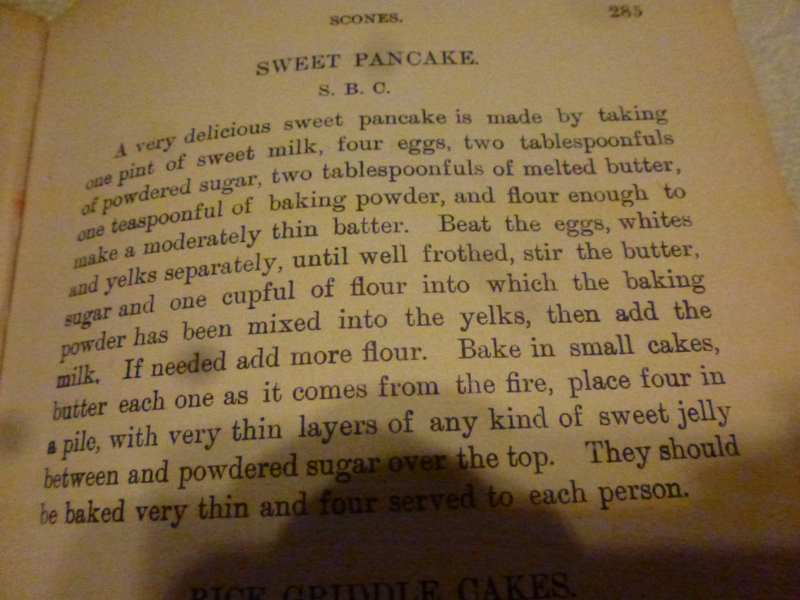 So tonight I’ve selected a recipe for Sweet Pancake from the 1898 New Galt Cook Book. Unfortunately the contributor chose to be somewhat anonymous using the initials S.B.C. I’m going to make just half the recipe so that I don’t have to eat pancakes for a week. I like them but not that much! I really need to take my own advice and read recipes over twice before starting to make them. I’ve become accustomed to recipes with very few directions and so I didn’t pay much attention to the directions given in the middle of this recipe. I knew I had all the ingredients so I just started mixing. I cracked two eggs into a bowl and whisked them a little before adding 1 cup (1/2 pint) of milk. Next I added 1 tablespoon of butter and 1 tablespoon of icing sugar (powdered sugar). I was supposed to add 1/2 a teaspoon of baking powder but it was slightly more. I mixed them well and then added 1 cup of flour. The batter seemed about the right texture and then I read the directions again and realized that I was supposed to have separated the eggs and combined the other ingredients in a different order. I decided to continue knowing that it might not be exactly as the author had intended but might still give me some idea of taste. It is possible the texture will be affected but I just didn’t have more milk or eggs to spare to redo the entire recipe. Two stacks of sweet pancake ready to sample. I heated a frying pan and put a bit of butter in it. Once it was hot I dropped the pancake batter using a tablespoon. This made nice small thin pancakes. Once they were cooked on one side I turned them over. 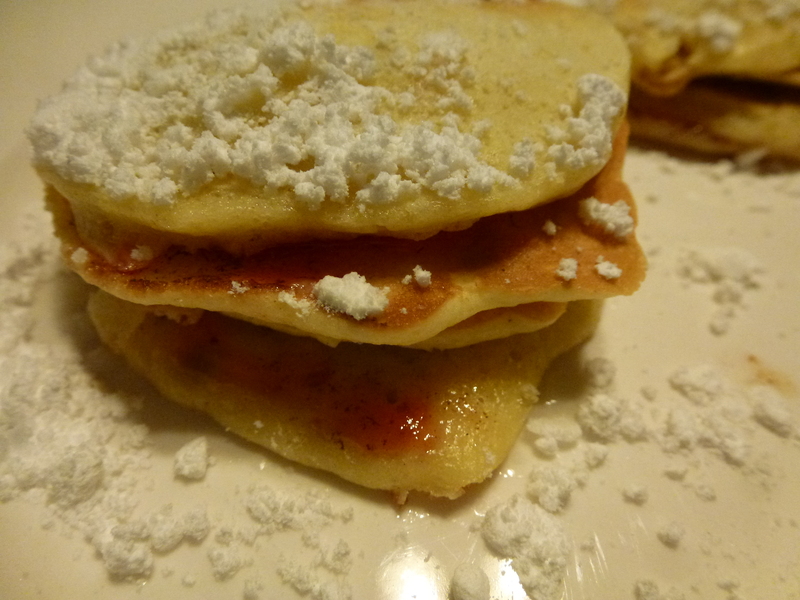 As I removed each little pancake I put some butter on it and some strawberry jam and then added another pancake on top. Each layer was buttered and a tiny bit of jam spread on top. The final fourth pancake received a dusting of icing sugar instead of jam. I made two stacks and sat down to eat my sweet pancakes. As mentioned I have no idea about the identity of S.B.C. or why she (or maybe he) is using initials. S.B.C. contributed forty-five recipes to The New Galt Cook Book so it is unfortunate that this person is unknown. The recipes appear in several sections of the cook book. Getting up close to a Sweet Pancake. I ate both my stacks of pancakes. The Sweet Pancake recipe works and the presentation is fun. The pancakes themselves are not sweet but the jam between the layers makes a nice addition. I originally thought the pancakes were some version of crepe but I’ve never beaten yolks and whites separately or added leavening (baking powder) when making crepes. They are a bit like “silver dollar” pancakes — at least the way I made them. If you’d like to add a new spin to your typical pancake supper or want to finish the meal with pancakes for dessert then try S.B.C.’s recipe for Sweet Pancake. A very delicious sweet pancake is made by taking one pint of sweet milk, four eggs, two tablespoonfuls of powdered sugar, two tablespoonfuls of melted butter, one teaspoonful of baking powder, and flour enough to make a moderately thin batter. Beat the eggs, whites and yelks separately, until well frothed, stir the butter, sugar and one cupful of flour into which the baking powder has been mixed into the yelks, then add the milk. If needed add more flour. Bake in small cakes, butter each one as it comes from the fire, place four in a pile, with very thin layers of any kind of sweet jelly between and powdered sugar over the top. They should be baked very thin and four served to each person. I started to feel a bit better tonight so I decided to make something simple — Pancakes. 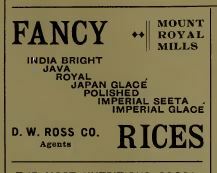 The recipe was contributed by Mrs. James Young to the 1898 New Galt Cook Book. I divided the recipe in half. I put one cup of all-purpose flour and one teaspoon of baking powder in a bowl and the added one cup (1/2 pint) of milk. I added two medium eggs and then mixed well. I added a bit of salt and prepared the frying pan. Once the pan was hot I spooned in the batter. I kept the pancakes small and turned them with a fork when cooked on one side. They puffed up a little and once the pancakes were ready I topped them with a little butter and maple syrup before sampling. Mrs. James Young is Margaret McNaught. Her younger sister Frances was one of the editors of The New Galt Cook Book. Maggie McNaught was born in Scotland while her sister Fanny was born after the family arrived in Fergus Ontario. Margaret married James Young and they lived in his home town of Galt Ontario. They had two children. James owned a newspaper and eventually got involved in politics. He was an MP in the new Canadian federal parliament. These are a nice simple pancake but not to my taste. I’d prefer them with one less egg both for flavour and texture. However, if you don’t already have a favourite pancake recipe then give it a try. These are not pancake mix pancakes! Two cups flour, one pint milk, two teaspoonfuls baking powder, one pinch salt, four eggs. Today is New Year’s Day. The first day of 2014 and the first day of another self imposed challenge — to cook everyday from an historic cook book. This time we travel a few years further back in time. We have transported ourselves from the 21st century back to the early 20th via the 1906 Berlin Cook Book and now are in the late 19th century when The Galt Cook Book was published. To ease the transition I’ve selected a recipe which has “German” in its title — German Method of Buckwheat Cakes. This recipe was contributed by Mrs. Hunt of Speedsville. I’m not sure what makes this German, why pancakes appear in the Scone section or how someone in Speedsville is connected to Galt. My father loves buckwheat pancakes and I’ve grown to like them too. I thought this recipe would be a good way to begin the year. At first I thought I had to start making it last night in 2013 but when I read the recipe more closely it looks like I can make it today. First I put a cup of “tepid” water in a bowl. I chose to use water that was much warmer than tepid in order to help the yeast along. My kitchen was cold and the buttermilk was in my modern fridge so it was cold. I was worried the yeast wouldn’t work if added to a cold liquid. I added a cup of buttermilk. Unless you have a dairy cow to milk, it seems impossible to get real buttermilk. Even if you go to the trouble of turning cream into butter and buttermilk, it still won’t be the real thing. My container of whipping cream lists several other ingredients — not just cream! I chose to use commercial “cultured” buttermilk. So far my bowl contains one cup of warm water and one cup of modern buttermilk. Next I added yeast. I was fortunate in 2012 to discover a local store EuroFoods that carries fresh compressed yeast. I’m fortunate to have worked with Fleischman’s compressed yeast cakes years ago as they aren’t available any more. I contacted Fleischman and they explained they no longer distribute them in Canada. Instead they gave the following equivalency: “Active dry yeast is an excellent substitute for fresh yeast. One small (.6-ounce) cake of fresh yeast is equivalent to one envelope dry yeast. One large (2-ounce) cake is equivalent to three envelopes dry yeast. Dissolve active dry yeast in warm water (100° to 110°F) and proceed with the recipe as directed.” Since I’m trying to be as accurate as possible I decided to use the fresh yeast. The next issue was quantity. The recipe doesn’t indicate how much yeast to use. I looked at several other recipes in the cook book to try to get a sense of quantity. I decided to use an amount equivalent to one yeast cake. I stirred a tablespoon of my fresh yeast into the liquid. The yeast was also cold since it also came from my modern fridge. Fresh yeast has a very short shelf life even if it is kept chilled. Buckwheat pancake batter ready to rise. I decided to turn on my oven to a very low temperature in order to warm up the batter a little and help the yeast along. The yeast wasn’t well blended in the liquid so I decided to add the flour. This presented another problem. How much flour? The recipe above for Buckwheat Pancakes uses a proportion of one and a half cups of liquid to one cup flour and two cups buckwheat flour. 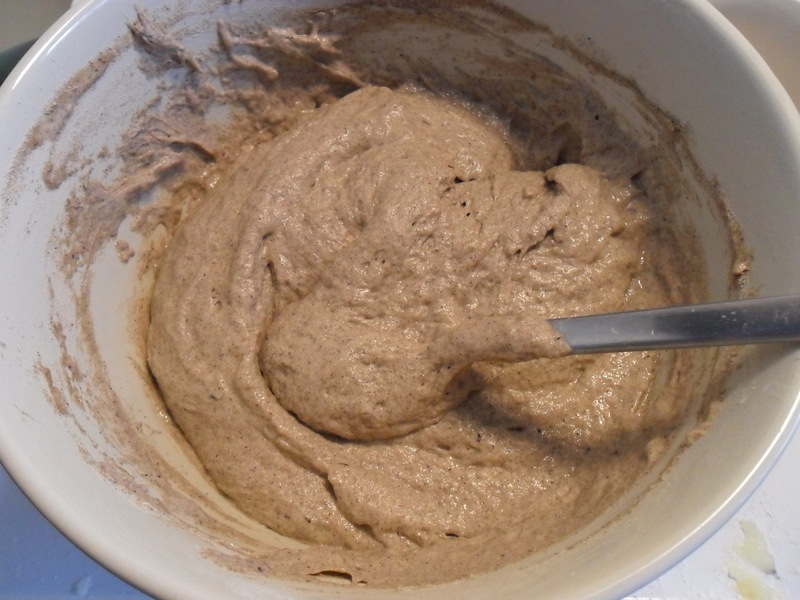 My mixture had another cup of liquid but I decided to use one cup of all purpose flour and two cups of buckwheat flour. This created something a bit like batter bread which I suspected was close to the intended texture. I covered the bowl of batter and left it on top of the stove to keep warm. I plan to check it in an hour and hopefully I’ll be able to make some pancakes. Buckwheat is not commonly grown in southern Ontario anymore. Although the name makes it sound like it is some version of wheat it is an entirely different plant according to Wikipedia. If you find buckwheat groats in a store you can see that it is a type of seed. When the seed is finely ground you have buckwheat flour which is darker in colour than wheat flour and has a more pronounced taste. Sometimes it is grown near bee hives to produce delicious buckwheat honey. The bees gather the buckwheat pollen and their honey has the flavour of buckwheat. My father’s family had bee hives on their farm and sometimes ended up with buckwheat honey. It is still one of his favourites. Some grocery stores carry buckwheat flour in the specialty flour section and I can often find it in bulk food or natural food stores. Is buckwheat is suitable for people avoiding gluten or wheat? Thick buckwheat pancakes in the pan. After an hour and a half I checked on my buckwheat cakes batter. It was bubbly! Success. I put a teaspoon of baking soda in a glass and added at least a tablespoon of warm water. I wanted to dissolve the soda before adding it to the batter. I also sprinkled some salt on top of the batter. I stirred everything together again and watched my bubbly batter go flat. I’ve baked enough bread to know that will happen. I heated some oil in a frying pan and put in two dollops of batter. I don’t like thick pancakes so I also put some batter in a small bowl and added a bit of warm water and buttermilk to it. I stirred and added a dribble of maple syrup. Once the first pancakes were done I used my thinner batter to make some more. This is one of the few times I truly miss having a wood fired cook stove and a cast iron frying pan. I think these pancakes would be even better made with the equipment of 1898. This edition of the Galt Cook Book was published a few years after most of the recipes were contributed. Does Mrs. Hunt still live in Speedsville in 1898? Was her recipe in the first edition? Speedsville was a small community between Hespeler and Preston and is now part of Cambridge Ontario. It is possible that Mrs. Hunt is Matilda A. Hudson. Matilda was born in England in 1836. The 1851 census shows her future husband 18 year old James Hunt living with his parents in the village of Preston where he works in the family cloth manufacturing business. Matilda was living in Port Hope in 1858 when she married Canadian born James Hunt. By 1861 census, James is listed as a manufacturer and the young couple live in a single family, single story frame house. Mr. and Mrs. Hunt’s religion is Wesleyan Methodist. The 1891 Canadian census lists Matilda as 53 and John age 55 is a foreman in a woolen mill. The household also includes a 56 year old widow named Emeline Winter. It appears Mrs. Winter might be employed as a nurse or some sort of domestic help for the couple. By 1901, John has died and Matilda lives alone except for her fifteen year old niece Bertha E. H. Hunt. The 1911 census shows Matilda living in the town of Preston as a boarding house keeper with one lodger — a 26 year old public school teacher named Ethel Grimm (or Gimm or Gunn). But in 1898, Mrs. Hunt’s recipe for German Method of Buckwheat Cakes appears in The New Galt Cook Book. I’m still not sure why this is a German method. Perhaps she learned it from a German neighbour? What she’s creating is a starter – something that be used over and over as the start to another batch of pancakes or perhaps even other baked goods. It must be “fed” after it is used. I’m going to try to keep this going for a little while just to see if it works. 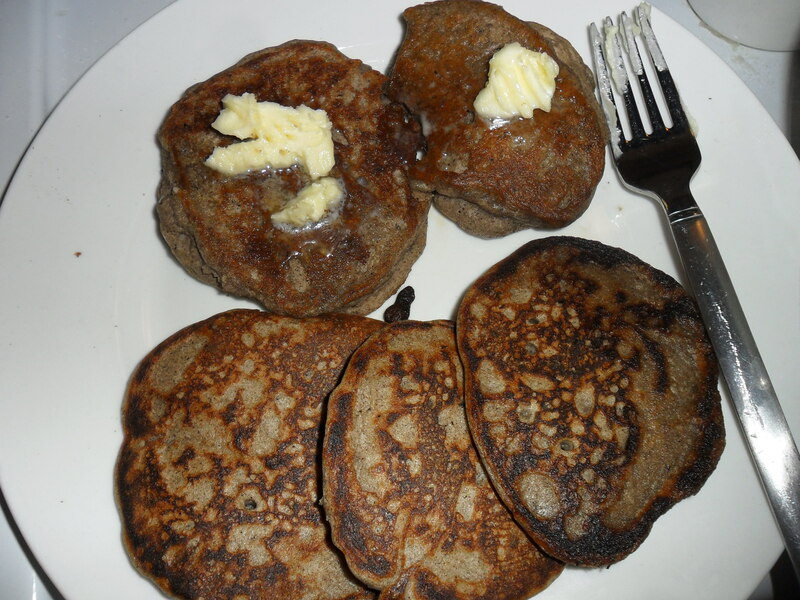 Buckwheat Pancakes — thick ones with butter and thin ones plain. Mrs. Hunt’s pancakes are good. I should have added a bit more salt to the batter and perhaps a little less yeast. The buckwheat flavour is present but not overwhelming. These are not pancake mix pancakes. 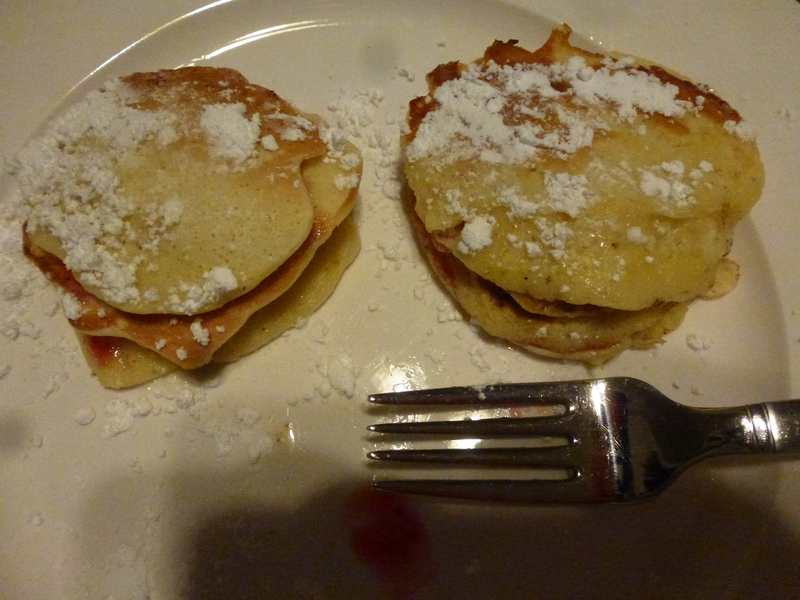 Although I liked the crispy edge of my thin pancakes I was surprised that I preferred the thicker ones. I think adding maple syrup to the batter was a mistake. Syrup is marvelous on top of both versions. This recipe won’t appeal to everyone since some people find buckwheat an overpowering taste but there is some scope for a modern cook to experiment with flavour and texture. 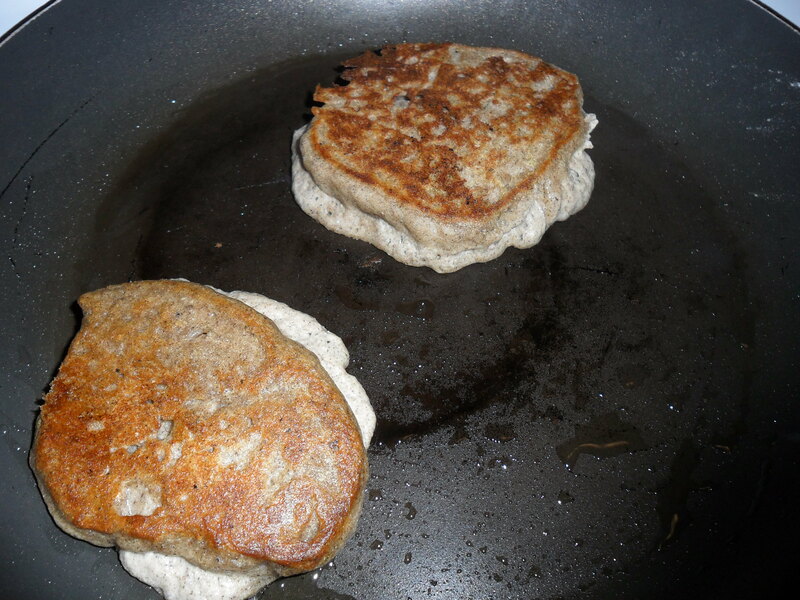 I have plenty of batter left to feed and keep as a starter so I’ll be able to try making buckwheat pancakes again. I suggest you try it too. Although this recipe required some detection it is a good start to the year of cooking with The New Galt Cook Book. Let me know if you try the recipe and share your memories of starters. How long did you keep it going? Did it ever overflow? 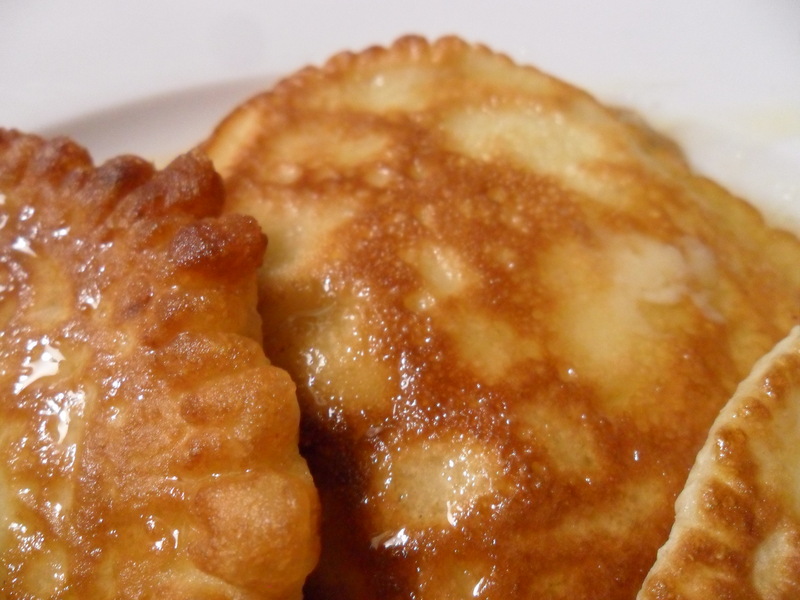 Do you have memories of buckwheat pancakes or buckwheat honey? Make a batter in the usual way of equal parts of buttermilk and tepid water, add yeast sufficient to raise it; when light add just enough soda to correct the acid in the buttermilk, also a little salt; when through baking put in some buttermilk and water, stir in flour and set in a cool place. They will be light by next morning. The writer has kept batter in this way for three months without renewing. It will renew itself and never sour unless kept too warm. To help brown, add a little syrup or cornmeal.